But with all our wisdom we cannot read the riddle of Stonehenge. Stone­henge, like its mythical prototype, sits by the wayside and propounds to all passers the riddle of its origin—the wherefore of its existence. All we know for certain about this wonderful collec­tion of stones is the fact that before English history commenced they stood, even as they now stand, the marvel of the plain. Myth and tradition have certainly been busy with tales of the building. Rival archaeologists have waged a friendly warfare on behalf of their own favorite hypotheses, but none can speak with a definite certainty and tell us what tribe or nation or sect placed the stones in position. Learned societies have held their judgment courts on the spot and weighed the pros and cons of the case with Pickwickian deliberation without being able to re­turn a definite verdict against either the men of the stone, the bronze, or the iron-age. No; there they stand, built for eter­nity, and we can only surmise and won­der and place together-the various tra­ditions and myths relating to the -spot in the hope that one may give a clue to the correct interpretation of the rid­dle. Our photographs will give a better idea than words can describe of the rel­ative proportions of the stones and their general appearance, but they must be seen to be properly appreciated; and like "fair Melrose,” moonlight is the best time to get their weird effect and to be impressed with their immense size. They stand on rising ground, almost in the center of Salisbury Plain, far from any village, and, until lately, miles from human habitation. From a dis­tance one can imagine they are the ruins of some ancient watch tower, whose watchman might have descried the march of the Roman legions under Vespasian to take up a position in their camp hard by. But as we drive nearer, and as they stand out against the sky, we begin to perceive their peculiar shape and get an idea of their tremendous size. Surrounding the stones at a distance of about one hundred feet is a slight bank of earth. The principal entrance to Stonehenge is on the northeast, and is marked by a bank and a ditch, the latter forming an avenue which leads straight to the temple. Directly in this entrance line, and about two hundred feet from the stones, stands an un­wrought sarsen monolith known as the Friar's Heel, sixteen feet high. On the morning of the summer sol­stice, June 21, the sun rises immediately over this stone and casts its first rays through two uprights of the outer cir­cle of Stonehenge upon a horizontal stone lying nearly in the center, and known as the Altar Stone. This inter­esting sight has become quite an annual ­outing for the scientifically inclined of the neighborhood, who, on bicycles and tricycles and in conveyances of every description, repair thither in the early-morning hours to await the rising sun and, if they are fortunate enough, to see its beams fall upon the ancient stone. Stonehenge consisted of an outer cir­cle, of upright stones standing about four feet apart and sixteen feet high. Others were placed horizontally on their tops and touching one another, form­ing a continuous corona. This outer circle bears evident marks of having been wrought with tools. The uprights have each two tenons on their upper surface which fit into mortise holes cut into the under surface of the horizontal stones. 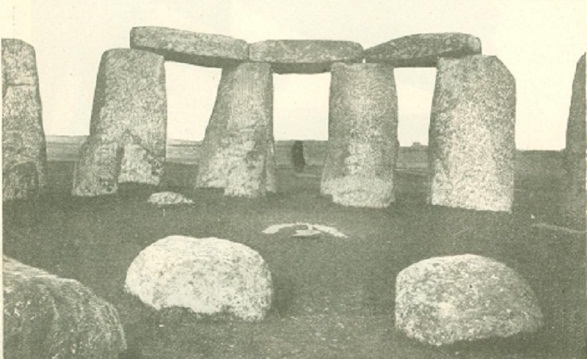 At a distance of about nine feet within the outer circle were thirty sin­gle stones, each four feet high; and again within this double circle stood the most imposing feature of Stonehenge, the five great trili­thons. They rose from those standing nearest the northeast en­trance, sixteen feet high, to the central group, towering nearly twenty three feet in height. It has been computed that the weight of the Great Trilithon is no less than seventy tons. 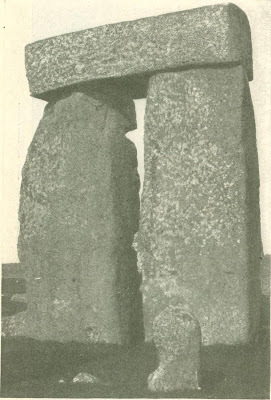 Within the horse­shoe figure formed by these five trilithons was another series of sin­gle stones, fifteen in number, whose average height was eight feet. Lying within this second horse­shoe, if we may be allowed the term, at the foot of the Great Tri­lithon, is a large slab, sixteen feet long. This is the Altar Stone, and on it, tradition says, sacrifices were offered by the Druids. It is a nice fancy to imagine the sun rising on the summer solstice immediately over the Friar's Heel and pouring its first rays on the altar stone, where a victim has just been slaughtered by the sun wor­shipers as an offering to their deity. Indeed, some go so far as to point out certain marks on this ancient stone and gravely to aver them to be the bloodstains of human vic­tims. They seem impending in the air. Yet there is enough left of the stones still erect, as well as of those lying prostrate, to fill us with wonder and admiration at their colossal size and the force and skill which must have been exerted to carry them to their present site and set them up. In our day, with all our mechanical inventions, it is no joke to convey a mass the weight of Cleopatra's Needle and fix it in position. How much more difficult for the barbarians of an­cient Britain, even supposing that the greatest stones were found in the im­mediate neighborhood, to haul them over Wiltshire hills and dales to this lonely spot on the plain, and then, after digging the holes and sinking the great uprights, to hoist up the masses of stone to form the corona; and what a labor of love to fashion them with rough tools of flint or bronze, to hollow out the mor­tise holes and chip off the stone to form the tenons. Ruskin tells us, in his "Seven Lamps of Architecture," of the Lamp of Sacrifice. Surely the religious idea must have prompted such a hercu­lean task as the building of Stonehenge. No wonder that conjecture has conjured up a race of African giants, ascribed their origin to some satanic influence, or advanced the strange theory that the stones are made of a wonderful concrete, which was gradually built up to the required height. The stones are of three different varieties, the sarsens (the large stones found in the neighborhood), syenite, and a foreign greenstone. The presence of these foreign stones, which must have been brought from a considerable distance, either An­glesea or the continent, certainly lends color to the belief, held by some archaeologists, that Stonehenge must be attributed to one of the continental tribes, who in their periodical visits to the shores of Britain brought these sacred tribal stones and erected them here as being necessary adjuncts to their worship of the sun. Of course, the argument against this supposition is that a foreign tribe would never have troubled to convey the heavy masses so far inland; that suitable positions nearer the coast, more ac­cessible than a Wiltshire down, could readily be found; and that it is ridiculous to suppose that any tribe would undertake the pro­digious task of water carriage. Sup­posing the English were aggressive enough to invade France or Germany, can we by any stretch of fancy imagine their workmen conveying St. Paul's Ca­thedral, and setting it up on the plains at Carnac, or in the Black Forest? 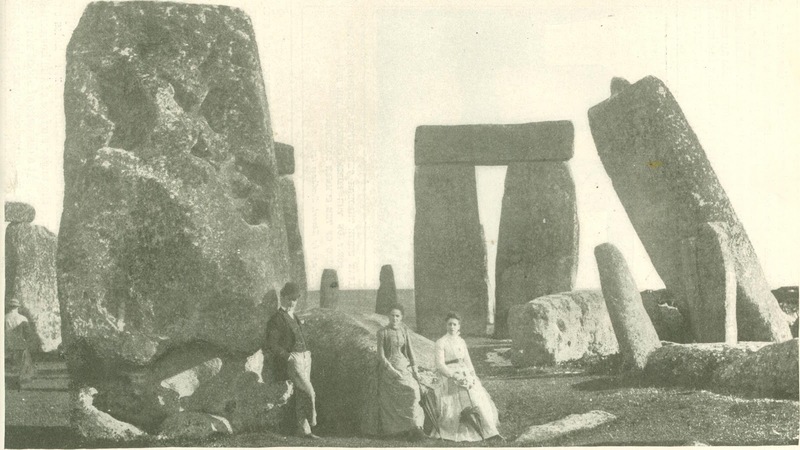 Would it not be something of a parallel case for any foreign visitors to have brought Stonehenge to England? Within sight of Stonehenge, and sur­rounding it on every side at a respect­ful distance, are a number of tumuli. About three hundred have been count­ed. Many of these ancient burying mounds have been opened, and have been found to contain in some cases skeletons and in others merely the charred remains of a funeral pyre, show­ing that the mode of burial varied dur­ing the time in which the tumuli, or barrows, were formed. The articles accompanying the hu­man remains also vary nothing but flint implements and stone utensils being found in some, while in others articles of bronze, and even of gold, have been discovered, along with pieces of stone which had evidently been chipped off in the fashioning of Stonehenge. If these tumuli are coeval with the build­ing and use of, Stonehenge, they cer­tainly are a strong argument in favor of Sir John Lubbock's assertion that we may place the age of Stonehenge in the later Neolithic or early bronze-age. It would have been an interesting sight to have watched the construction of Stonehenge. First of all, to have seen those patient early astronomers marking the periods of the sun's annual journey and drawing the plan of their temple; and then to have seen hundreds of our prehistoric ancestors harnessed to a rough sledge and dragging, by means of coarse hide ropes, the ponder­ous masses of stone across the plain; to have seen them digging the pits to receive the great uprights, probably car­rying the earth in wicker baskets to help raise the bank encircling the place; then, after the shaping of the tenons and mortise holes, to watch the gradual levering until the stones slid into the pits and remained upright. Then the building of a rude platform, and the bringing of two strong young trees to be placed slantwise against the huge pillars, to form a slide up which to drag the stones to form the corona. Labor was cheap then, and tine not precious, as it is today. But they were no jerry builders, those ancient workmen, and their work re­mains after the lapse of untold cen­turies, while towns and nations have been built, crumbled into dust, and passed away, as a monument of what patient perseverance can accomplish. It is a ruin now, but magnificent in its fall. It is to be regretted that, in the strict sense of the word, it is not public property. Such a relic, should belong to the nation, and receive the most careful attention from responsible architects and archaeologists, to assure its proper preservation and to hand it down to become the wonder of future generations. Not that we can believe the present owner would ever be per­suaded to allow the great monument to suffer injury—the Antrobus family have ever been too good guardians for that; but there always remains a possi­bility that one day some enterprising citizen of Chicago or Omaha may ship it off to adorn a park in his own city. As much as the Wiltshire Downs, on which Stonehenge stands, it belongs to the Old World. To what era in that world we cannot say with certainty. Pepys enters in his diary after a visit. "God only knows." From the Junior Munsey, May 1900.